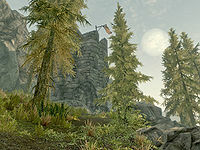 Bannermist Tower is a simple three-leveled Nordic tower occupied by bandits, located south of Moss Mother Cavern and Hunter's Rest, east of Knifepoint Ridge. There is one bandit patrolling outside the tower. Off of the path leading up to the tower, to the south, is a bird's nest containing a pine thrush egg and a second nest with another egg at the base of the tower. Also, a vacant beehive can be found hanging underneath the entrance ramp as well as a blue mountain flower and thistle by the foot of the tower. The entrance ramp is located at the rear of the tower, lodged between the tower and the hill. Just before the entrance ramp, at the base of the tower, is an apprentice-locked gate to the storage area. Inside is an unlocked chest and a table beside it holding a large coin purse, two garnets, an amethyst and four loose septims. The stairs down end in a cave-in where there are two patches of imp stool fungus. The first level holds only sacks and barrels of foodstuffs and two bedrolls, one of which is often occupied by a sleeping bandit. 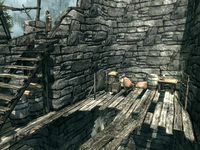 On the second level of the tower, across a plank walkway, is a tanning rack, various crates, sacks, barrels, and a small wooden table holding a copy of the Lockpicking skill book Advances in Lockpicking (see bugs). Also, there is a weapon rack holding an iron sword and warhammer (which may have fallen to the floor). An unlocked chest is tucked away beneath the stairs behind more barrels and sacks leading up to the third level. The top level is simply a lookout station and usually contains a bandit, with a small table where a copy of a random common book has been left for some light reading while enjoying the scenery, and on the floor are three loose iron arrows. The skill book may have fallen through the table and floor and be found near the entrance by the top of the ramp. ?